The University of Connecticut (UConn) is a public research university in the U.S. state of Connecticut. UConn was founded in 1881 and is a Land Grant and Sea Grant college & member of the Space Grant Consortium. The university serves more than 30,000 students on its six campuses, including more than 8,000 graduate students in multiple programs. “Wayang Puppet Theater of Indonesia” with Matthew Cohen on 5/1 at 7 p.m.
“Something,” a Puppet Horror Film by Kat Folker on 5/3 at 7 p.m. The Ballard Institute will be closed on Sunday, 4/21 for Easter. 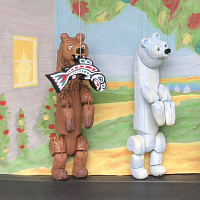 “Goldilocks and the Three Bears” by Stevens Puppets on 4/27 at 11 a.m. and 2 p.m.
Holy Puppets: Performing Objects in the Middle Ages with Michelle Oing on 4/10 at 7 p.m.
SOLD OUT: “Go Home Tiny Monster” by The Gottabees at 11 a.m. and 2 p.m. Both performances of Go Home Tiny Monster by the Gottabees are sold out for 3/30. “Paper Cut” by Yael Rasooly on 4/5 at 7 and 9 p.m.
“Go Home Tiny Monster” by The Gottabees on 3/30 at 11 a.m. and 2 p.m. In an enchanted Alaskan forest, join a family of bears as they encounter different perspectives and values, ultimately sharing a common purpose with a salmon, and resolving their conflict with a golden-haired trespasser, who learns precious lessons from them as well as from her bald eagle companion about respect, kindness, apologizing, and forgiveness. This show is 45 minutes long and recommended for ages 3+. Stevens Puppets was founded in 1933 by the Peabody-Award-winning Martin Stevens, a pre-eminent American puppeteer and a founder of the Puppeteers of America. With his wife, Margi, Stevens created ground-breaking touring marionette shows in the 1960s and 70s. Dan and Zan Raynor have been with Stevens Puppets for over 20 years, each coming from live-theater backgrounds of acting and directing. Dan holds a Bachelor of Arts degree in Theater and Zan holds a Master of Theology with a doctorate in Canon Law. Dan has taught theater at the Northwest Arkansas Academy of Fine Arts and directed professionally for theaters in several states. He has performed with and directed many professional musicians like Neil Young and Huey Lewis, and acted professionally with many theater companies in California. In addition to performing on stage as an actor and dancer, Zan has directed high school and college theater programs, and designed lights, costumes, and choreography for numerous theater companies in the Midwest and Northeast. Zan has taught every level of school, from Montessori preschool through university classes. The Raynors divide their time between studio artwork, both original and restoration, training other performing artists, managing complex tours, and performing all around the country at schools, libraries, festivals, and fairs. Tickets can be purchased in advance at the Ballard Institute and Museum of Puppetry, by calling 860-486-8580, or online at http://bimp.ticketleap.com. A surcharge will be added to any purchases made online. Tickets may also be purchased at the Ballard Institute on the day of performance starting at 10 a.m. There will be open seating and no reservations. Visitors can park in the Storrs Center Garage located at 33 Royce Circle. Parking is free for the first two hours and $1 per hour thereafter, with a daily maximum charge of $8. For more information about these performances or if you require an accommodation to attend this event, please contact Ballard Institute staff at 860-486-8580 or bimp@uconn.edu. The Ballard Institute and Museum of Puppetry at the University of Connecticut will present the grand opening of its new exhibition Itâs Always Pandemonium: The Puppets of Bart Roccoberton, on Saturday, April 27, 2019, with refreshments at noon followed by a free tour of the new exhibition at 12:30 p.m. All events will take place at the Ballard Institute, located at 1 Royce Circle in Downtown Storrs. The exhibition will be on display through Sunday, Sept. 29, 2019. Itâs Always Pandemonium celebrates the ongoing puppetry career of Bart. 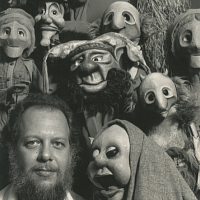 P. Roccoberton, Jr., from his touring days performing with his troupe the Pandemonium Puppet Company; to his founding of the Eugene OâNeill Theater Centerâs Institute of Professional Puppetry Arts; and now, to his work building puppets and puppeteers as Director of the UConn Puppet Arts Program. Itâs Always Pandemonium, curated by UConn Puppet Arts MFA candidate Matt Sorensen, features over 60 puppets, masterfully designed and crafted by Bart Roccoberton, his Pandemonium collaborators, and countless UConn Puppet Arts students under his guidance. Bart. P. Roccoberton, Jr. is Director of the University of Connecticutâs unique Puppet Arts Programâthe only one of its kind in the U.S.âwhich offers BFA, MA, and MFA degrees in puppetry. His professional projects include work in film, television and the stage, including Broadway. He serves the National Puppetry Conference at the Eugene OâNeill Theater Center as Director of Production, and is recognized internationally as an advocate for the Puppet Arts in the United States. performing all around the country at schools, libraries, festivals, and fairs. Traditions of puppet theater in western Indonesiaâwayang kulit, wayang golek, and wayang klithikâwere once inseparable from communal rites and spirit beliefs and flourished in situations of collective creativity. With modernization and globalization, wayang puppet theaters have become media for moral guidance, secular entertainments, and symbols of local identity, and named artists (puppeteers as well as puppet makers) have become more prominent and assertive of individual agency. 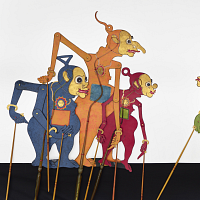 This talk, illustrated by puppets from the unmatched Dr. Walter Angst and Sir Henry Angest Collection of Indonesian Puppets at Yale University Art Gallery, explores the dynamics of collective and individual agency in wayang during the colonial and postcolonial periods as a reflex of the changing world. Matthew Isaac Cohen, Ph.D. is Professor of International Theatre at Royal Holloway, University of London and Institute of Sacred Music Fellow in Sacred Music, Worship, and the Arts at Yale University for the academic year 2018-2019. He is a leading expert on Indonesian performing arts and performs wayang on occasion under the company banner of Kanda Buwana. Admission to this event is free (donations greatly appreciated! ), and refreshments will be served. Come early, and experience our puppet exhibitions, as well as the video resources in our library nook. Forums will be broadcast via Facebook Live. For more information, or if you require an accommodation to attend a forum, please contact Ballard Institute staff at 860.486.8580 or bimp@uconn.edu. The Ballard Institute and Museum of Puppetry at the University of Connecticut will host a screening of the new puppet horror film "Something" by UConn Puppet Arts Program undergraduate student Kat Folker â19 on Friday May 3 at 7 p.m. at the Ballard Institute Theater, located at 1 Royce Circle in Downtown Storrs. "Something" is a short horror film with live actors and puppets inspired by the 1980s written and directed by UConn senior Kat Folker. 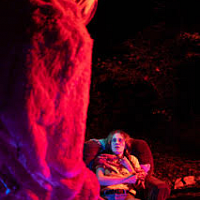 It follows the story of a teenage girl trying to protect a monster from discovery when heightened suspicions threaten to expose it. Kat Folker is a senior BFA student in the UConn Puppets Arts Program from Ashford, Conn., and has been a Waring Award recipient at the Ballard Institute for three years. Something is her University Scholar thesis project and sponsored by the IDEA Grant program. She is interested in pursuing a career in special effects upon graduation. You can also see her work in Letâs Be Friends, a short horror film by UConn Digital Media and Design alumnus Ryan Glista. "Something" is recommended for ages 13+ (for violence) and is 15 minutes long. Admission is free. Due to limited seating, tickets must be reserved by visiting the Ballard Institute and Museum of Puppetry, calling 860-486-8580, or online at http://bimp.ticketleap.com. For more information, or if you require an accommodation to attend this event, please contact Ballard Institute staff at 860.486.8580 or bimp@uconn.edu. is on Facebook and Instagram! Follow us to see what’s been going on!